Hayden is 10 and a half, Madison and Logan turn 8 in November this year and it’s only been in the past couple of months that I’ve been able to string together a few nights in a row of complete, uninterrupted sleep. That’s over a decade of sleep deprivation! Dog hair and sleepless nights. If I spend my days focusing on them, I can quickly become a cranky old man who is too distracted and surly to enjoy life properly. Of course having 3 young kids and a puppy in the house aren’t easy, but it’s not their job to make me happy. Instead of focusing on the challenges, the inconveniences and the cost of private schooling (for the kids, not the dog), it’s my responsibility to remember and reflect on the positives that they bring to my life. The joy, the laughter, the love. With anything in life, what we focus on shapes our feelings. Our families, our jobs, our churches, our communities each contain annoying little elements that can rob us of our joy. 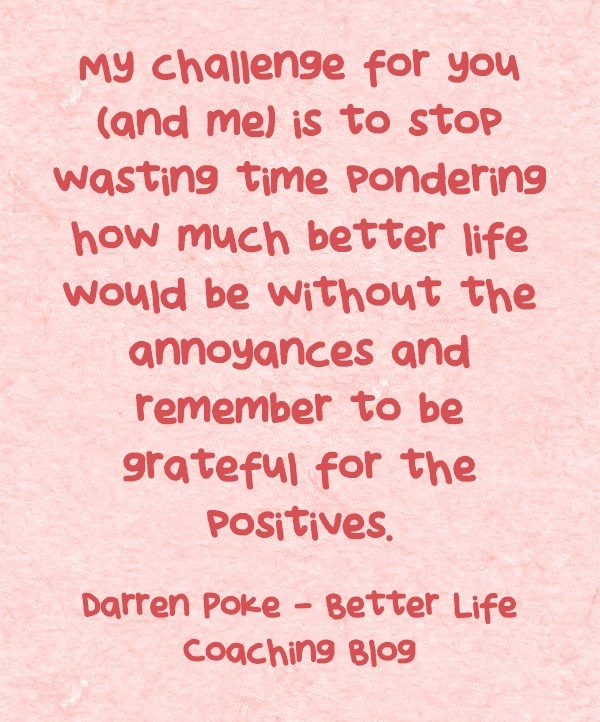 My challenge for you (and me) is to stop wasting time pondering how much better life would be without the annoyances and remember to be grateful for the positives.